Fact #8: Children who swallow toothpaste are at increased risk of mild fluorosis. The warning label on toothpaste reflects the fact that it contains a higher concentration (roughly 1,000 times as much fluoride) per milligram than fluoridated water. Fluoride toothpaste is recommended for babies and toddlers by the American Academy of Pediatrics, the American Association of Pediatric Dentistry, and the American Dental Association. The only risk to children of too much fluoride is dental fluorosis, which does not harm the teeth or a child’s health. That is why it is important to follow the guidelines on the proper amount of toothpaste to use, to supervise children when brushing, and to teach them to spit but not to swallow. Fact #9: Fluoridated water is safe for babies and young children. 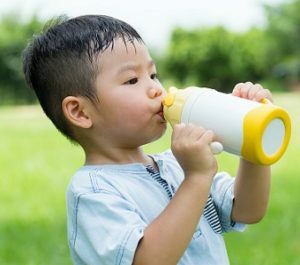 The ADA states that doctors “can suggest the continued use of powdered or liquid concentrate infant formulas reconstituted with optimally fluoridated drinking water.” Parents should discuss any questions they may have with their health care providers. Fact #10: Although Americans’ teeth are healthier than they used to be, many people still suffer from decay and the impact it has on their lives. Tooth decay is the most common health problem in U.S. children, five times more common than asthma. Tooth decay affects a child’s ability to sleep, speak, learn and grow. Poor dental health damages job prospects. A 2008 study showed that people who were missing front teeth were seen as less intelligent and less desirable by employers. In a 2008 study of the armed forces, 52% of new recruits were categorized as Class 3 in “dental readiness” — meaning they had oral health problems that needed urgent attention and would delay overseas deployment.